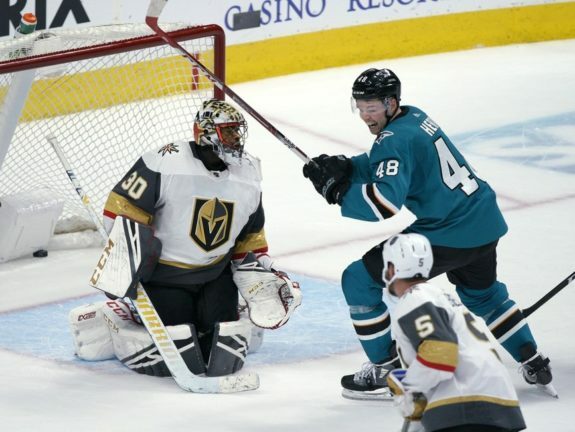 On Wednesday, the San Jose Sharks begin their quest for a Stanley Cup with an opening round series against the Vegas Golden Knights. 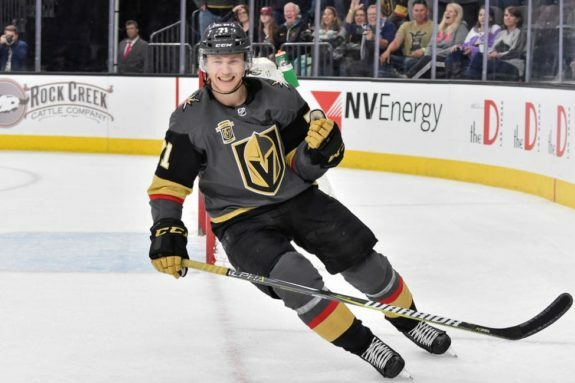 The Golden Knights are a formidable foe, and they have had great success against the Sharks. This alone is cause for concern, but it goes beyond this. The Sharks enter the Stanley Cup Playoffs with an elite roster and too many problems. They went 3-8-1 in their last dozen games, with all three wins over backup goaltenders. It wasn’t a good finish. Vegas also struggled late in the season. But make no mistake, these are teams with extremely talented rosters. Both are legit Stanley Cup contenders if they play to their level of talent. And yet, one will call it a season after Rd. 1. The team which wins this series will have a very good chance to win the Stanley Cup. The playoffs are a new season and most regular season sins are washed clean. For the Sharks, there is a checklist which they can adhere to which will give them the best chance to advance against the Golden Knights. Let’s get to it. The Sharks scoring against Vegas in last season’s playoffs came from two places. The power play and play behind the net. Play behind the net also draws penalties, so it is a two-fer. The Sharks must go there, shift after shift. The Sharks have elite power forwards (plus one defenseman who sometimes plays like a power forward) and this is one area other teams can not match. The power players must not cruise through this area, they must stop behind the net and battle. Sharks head coach Peter DeBoer should make it an edict. In the most recent match-up, Timo Meier threw Reilly Smith out of the way and Tomas Hertl scored moments later. Do that. All game long. Every game. The Sharks roll out elite power-play talent on two units. The expectations for power-play efficiency are very high given the talent. Meeting these high expectations and coupling it with more opportunities will greatly improve the Sharks chances in the series. By a lot. If the Sharks can make Vegas less aggressive because they fear taking penalties, even better. As with behind the net play, an effective power play is a potential two-fer. 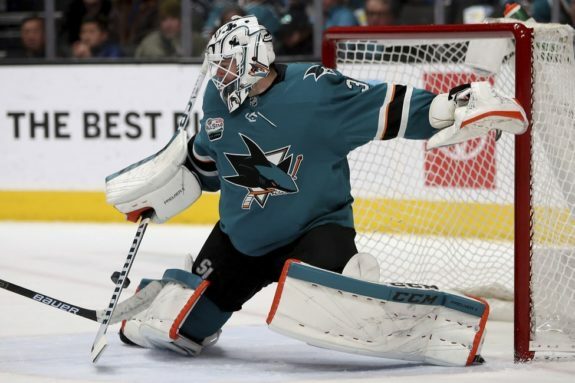 The Sharks goalie must play well, though he probably doesn’t need to be spectacular. If the Sharks get ‘playoff Martin Jones’ (historically good), they have a solid chance. If they get ‘regular season Martin Jones’ (not good), the Sharks might get swept. If the team doesn’t have confidence in their netminder, they’ll play differently in front of him, trying to cover up for his problems. It won’t work. Vegas brings an elite forecheck and the turnovers they cause lead to quick-strike scores. The Sharks do not need to always break out cleanly, that is too much to ask. But if they can’t break out cleanly, they will need to muddle the play so their defense can reset. 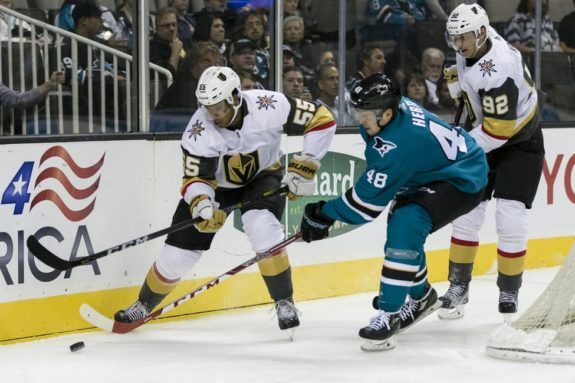 If the Sharks can turn the tables by overcoming the Golden Knights’ aggressive pressure and creating odd-man rushes, that will help. The Sharks won’t win a track meet, but if they can take occasional advantage of an overzealous forecheck, it can help win a close game. Or two. Vegas is really good on odd-man rushes and the Sharks have, at times, been really good at coughing them up. They’ve also been good, at times, at stifling them. The stifling version needs to show up. They’ll need to be cautious about allowing any sort of rushes, as Vegas is really good with lots of open ice. Last season’s infamous overtime playoff game-winner by William Karlsson came on a two-on-two rush. The Sharks can survive a modest number of open ice rushes where they have enough defenders back. They won’t survive if they allow even a modest number of odd-man rushes. Some combinations work, some don’t. It appears Brent Burns and Marc-Edouard Vlasic might pair together. Skating five-on-five this season, they’ve been on the ice for seven goals for the Sharks and 17 goals against them. Burns has had better results, actually much better results, with the reviled Joakim Ryan (21 for, 22 against). Vlasic was best with Tim Heed (16 for, 7 against). These aren’t close calls. DeBoer has to get them right. The top line of Joe Pavelski, Meier and Logan Couture features three impressive players. They totaled 95 goals in the regular season. But as a group, the newly formed line hasn’t yet proven to be the sum of its parts. It needs to be. There is reason for hope. Down the stretch, Couture was fighting a bug, Pavelski missed games due to injury and Meier missed the season’s finale. They haven’t had much chance to gel. They won’t have much time to gel now, but it needs to happen. Vegas has the sort of players who can cause an opponent to lose their poise. Ryan Reaves leads the pack, but others including William Carrier can also get under people’s skin. This happened in the series opener last season which the Sharks lost 7-0. 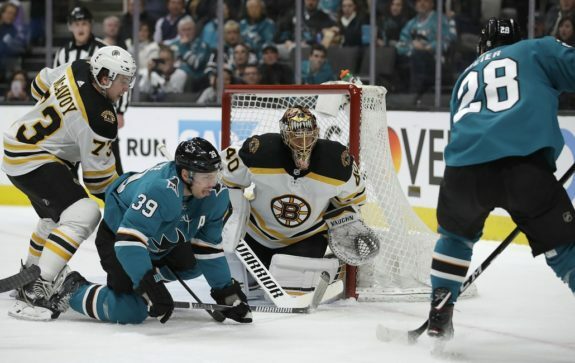 The Anaheim Ducks played without poise in last season’s playoff series against the Sharks – and got swept by the more poised Sharks. 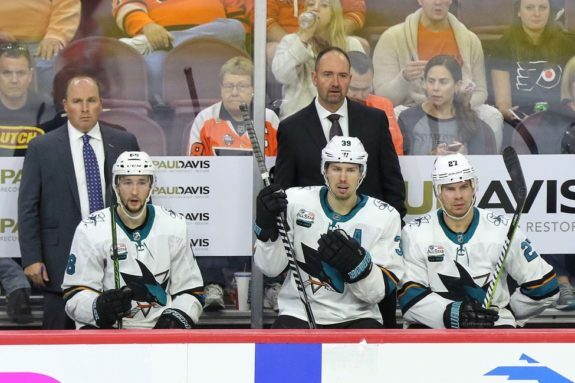 The Sharks need to focus on winning on the scoreboard, and not get distracted by the agitators. Related to poise is focus. The Golden Knights plays a relentless style. A lot of their success comes from mistakes other teams make while under constant pressure. Losing focus, even for short moments, can change a game. The Golden Knights are perhaps the best team in the NHL in turning opponent’s small mistakes into game-changing moments. These things can take a variety of forms, from a poor line change to an attempt for an individual to do too much on a play. The Sharks are capable of staying focused. In order to win the series, they must do it. There will be plenty of situations where DeBoer will need to look at the odds and make the right choice. In each of DeBoer’s prior seasons, he’s made a major mistake which gave the opponent a meaningful advantage and cost the Shark dearly. Any mistakes he’s made in the regular season are already baked in. At this point, he simply can’t add to them. The checklist is, for the most part, things the Sharks can control. They can play with poise, stay focused, make smart line-up choices, prevent odd-man rushes and so forth. Do the Sharks have to do all of this to win the series? They might not need to do all of it every game, but they’ll need to do almost all of it to win any given game. Vegas will leave the Sharks little room for error. A common refrain this time of year is: the team which imposes their will on the opponent wins the series. A good portion of checklist is largely about imposing will. In some cases, it is the Sharks imposing their will on Vegas. Going behind the net is an example. And some of it is about preventing Vegas from imposing their will on the Sharks, stopping odd-man rushes is an example. Nothing about this series will be easy for the Sharks. Vegas is a very good team and if not for their late season downturn (not surprisingly, coinciding with Marc-Andre Fleury’s absence), they might be the favorites to win the Western Conference. The Sharks have a terrific roster, but so does Vegas. By doing the key things right, the Sharks will give themselves a chance to win the series.